The Kali Yuga is Ending and we are now seeing the dawn of the Golden Age, which is the Age of Truth. Time is cyclical. Cycles of time spanning tens of thousands of years are divided into 4 Yugas or Ages. Each Age is based on their level of purity, called Golden, Silver, Bronze and Iron. In Sanskrit the 4 Yugas are called Sathya, Tretha, Dwapara and Kali. Of all the four, the current Kali Yuga is the darkest Yuga. The word Kali itself means the age of suffering and pain. During this Yuga, you suffer a lot. Diseases, old age, painful death, violence, terrorism, all these manifests in the age of Kali. Each Yuga is presided over by a Vishnu Archetype: Lord Rama ruled the Silver (Tretha) Yuga, Krishna ruled the Bronze (Dwapara) Yuga. Kalki presides over the ending of Iron (Kali) Yuga. Kalki is the avatar of Vishnu. He comes to the earth plane riding on a white horse to establish righteousness (Dharma). This universal archetype is seen in almost all mystical traditions. Kalki is Karuppasamy in the Indian Tradition. 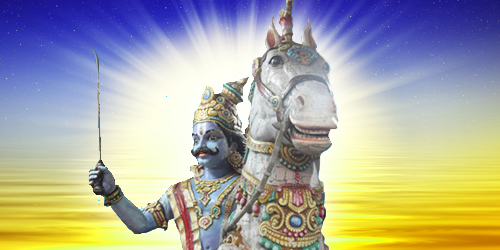 Karuppasamy is a very important God because he presides over this current time period which means he is active and ready to help. Presently, Karuppasamy is a little known village deity who is very similar to General Guan Di, the Taoist God of War. But Karuppasamy is not just a simple village God, he is the assimilation of the four Gods: Kala Bhairava, Narasimha, Veerabhadra and Rudra. Karuppasamy puts a quick end to all that is evil; be it evil eye, curses, black magic or even evil plotting. Karuppasamy can burst it all because this is his time period, more and more you will see Karuppusamy`s emergence into the mainline tradition. Birthdays of Gods allow you to create a link to them. Therefore April 14th IST is your chance to connect with Karuppasamy. It is very important to meditate and worship on his form or visit his temple on this day. In order to facilitate this Dr. Pillai will empower as many Karuppasamy shrines as possible on Karuppusamy`s birthday. There will be numerous fire rituals inviting him to come to this earth plane, followed by a feeding programme. You can help to establish the birth of Age of Truth or Sathya Yuga and create your connection with Karupasamy by participating in his birthday rituals. April 11th – April 19th IST, marks a powerful time for 3 Feminine Archetypes. Once a year during Spring, the Goddess energy descends into the Earth plane. You may miss her if you don’t pay attention or don’t care. Care is everything, if you don’t care for money, it will not be there. If you don’t care for relationship, relationship will not be there. During each night, you can pray or meditate to the respective Goddess and gain her blessings. Participate in the final night poojas and abhishekams to each of these Goddesses at some of their most powerful vortices. This coming April 14th IST, is the date for the Vedic New Year. The Vedic New Year gives you a chance to start new ventures with the full support of the Sun. The secret Cosmic Sun Power Spot is located in an unassuming location. According to Siddhas Millions of Suns visit the earth plane once a day at this specific location to receive energy from our own Sun for their continued sustenance. That is why we are performing a Vedic New Year group Homa at the Million Suns Power Spot on April 14th IST. Be a part of this Homa and revitalize your life force. The Punarvasu nakshatra under which Lord Rama was born, is known as “Return of the Light”. This star supports goodness and nobility into our world. Success comes but only after the second attempt. If you are undertaking a dangerous journey, departing when the Moon is aligned with the Punarvasu star, then it ensures a safe return.